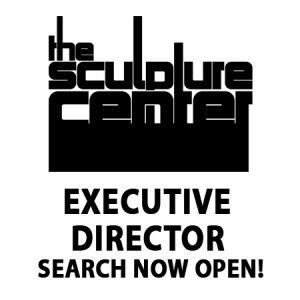 The Board of The Sculpture Center announces that we are accepting applications for the position of Executive Director + Chief Curator. The Sculpture Center is a non-collecting, contemporary arts organization in Cleveland, OH, with the mission of the education and career advancement of emerging sculptors of Ohio and its greater region and the preservation of Ohio outdoor public sculpture. We provide support for artists and effect the enrichment, education, enjoyment, and visual enhancement of the Cleveland community and beyond. The Sculpture Center exhibits the highest quality contemporary sculpture by rapidly rising, mid-career, and established artists with a focus on early career sculptors of our greater region. We value risk taking and an exploration of new avenues of creativity by every artist, and new artwork is created for all our curated exhibitions. We define sculpture as standalone sculpture, installation, expanded media, and performance. Develop and supervise annual budget, timelines, strategies, and goals in coordination with board and commensurate with the Strategic Plan. Track expenditures and income through QuickBooks, including responsibility for data input, monthly reconciliation, and review of payroll. Liaison with board members and 3-4 board committees and coordinate annual meeting of Exhibition Committee of 16-20 artists and arts related individuals to select W2S (Window to Sculpture Emerging Artist) artists. Initiate and coordinate all outreach including marketing, artist and community educational initiatives, and institutional collaborations. Fund raise imaginatively, strategically, and successfully with individuals, foundations, governmental funders in support of Board initiatives, including grant writing and growing a membership program from our existing supporters. Annually curate 3-4 solo or group exhibitions, initiate annual calls for artists, and realize 4-6 early career sculptor solo exhibitions in the W2S series, develop juried and guest curated group exhibitions. Work closely with exhibiting sculptors to bring their exhibitions to fruition on a modest budget. Provide curatorial and educational interpretation with essays, wall text, and web-based information. Produce artists’ catalogs when budget allows. Frequently update website data. Manage day-to-day institutional operations. Hire, as needed, and supervise 3 or more contract, part-time employees (including grant writer, marketing and communication coordinator for social media and press releases, web master, art teacher at community health clinic), 2 work-study students, and 2-4 interns throughout the year. Advance SculptureX, a teaching and networking resource and promotional platform formed to catalyze collaborations among teaching arts institutions and publicize their sculpture departments. Currently the most important aspect is acting as coordinator of the annual SculptureX Symposium (http://sculpturecenter.org/about-sculpturex/). Education – Minimum of BA or BFA, preference will be given to MA, MFA, MBA, or Masters of Arts Administration candidates. Work Experience – Minimum of 5 years of administrative experience. Attuned and open to artist and community needs. Connected in the artist and educational and arts institutional arenas of NE Ohio and/or our region. Versed in the trends and precepts of greatest currency in contemporary art and comfortable working directly with artists at all stages of their careers to bring their exhibitions to fruition. Comfortable with aesthetic risk taking, open to new ideas, and accommodating to a highly diverse range of ideas and people. Value the importance of mentoring undergraduate and graduate students of studio art and art history and early career sculptors with an interest in curating exhibitions. Believe that art making and understanding can and should be available to all members of our community. 4 weeks paid vacation per year. All inquiries will be answered, and all applications will be acknowledged. Only finalists will be contacted further. We are accepting applications until the position is filled.